Van Morrison's Bang sessions have been bootlegged and shamelessly repackaged for 50 years. This collection brings it all together the right way. While it may seem odd that Legacy Recordings has been all about Van Morrison reissue projects lately -- given the fact that Morrison is alive and well and still putting out decent music in his early '70s -- fans should be celebrating and not scratching their heads. In 2015 Legacy released an excellent three-disc anthology of Morrison’s young, hungry R&B ‘60s outfit Them. Last year saw a multi-disc sequel of his acclaimed 1974 live album It’s Too Late to Stop Now. And now there’s this. Morrison’s Bang Records era requires a bit of backstory, filled as usual with the requisite record company battles (Van harbors a notorious hatred for the record biz). In 1967 Morrison was a newly-minted ex-Them solo artist and was persuaded to record for Them producer Bert Berns’ new label Bang Records. In addition to being a prolific producer, Berns was also a legendary songwriter, co-writing classics like “Twist and Shout”, “Piece of My Heart” and the Them hit “Here Comes the Night”. With a new label and a tried-and-tested singer/songwriter under contract, Berns brought Morrison into a New York City studio for two days of recording sessions in March 1967. The sessions produced what was originally intended as four separate singles, but a full-length Bang album, Blowin’ Your Mind, was released September 1967 against Morrison’s wishes. Berns passed away only a few months later, but that didn’t stop Bang Records from re-releasing the songs in 1973 under the name T.B. Sheets -- once again without Morrison’s authorization. In the ‘90s the recordings surfaced in various forms -- including additional recordings made later in 1967 -- under titles like Payin’ Dues, New York Sessions ‘67 and Bang Masters. 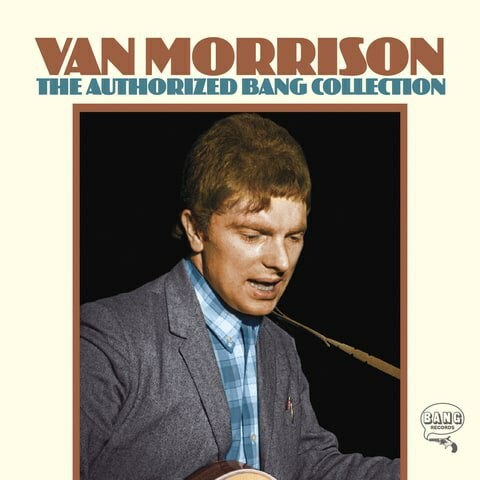 Whether or not these versions (complete with demos, bonus tracks and alternate takes) were released with Morrison’s approval is unclear to me -- he apparently signed a rather sketchy contract with Berns prior to the 1967 sessions -- but Legacy has managed to right these wrongs with the brand-new three-disc set appropriately titled The Authorized Bang Collection. Not only does this new collection have the official Van Morrison stamp of approval, but it also manages to bring together all the original 1967 Bang recordings, alternate takes and mono and stereo mixes that render all previous, dubious releases virtually obsolete. The most famous result of these legendary 1967 sessions is undoubtedly “Brown Eyed Girl”, Morrison’s unimpeachable pop classic, and it’s included here in both stereo and mono mixes as well as a series of truncated takes. It’s a joy to witness music history as Morrison and his crack band put the song through its paces until they finally get it right. For anyone unaware of the remarkable recordings beyond “Brown Eyed Girl” that came out of these sessions, The Authorized Bang Collection is a virtual goldmine. Morrison seems quite comfortable residing within the pop/R&B realm, tossing off should’ve-been-classics like the Latin-tinged “Spanish Rose” and the joyous, lusty stomper “Ro Ro Rosey” (“You’re the apple of my eye / Ice cream in my cherry pie”). Additionally, songs that ended up in more pastoral arrangements on his first true “Van approved” solo album, 1968’s seminal Astral Weeks, are presented here in looser, full band form. “Madame George” apparently catches Morrison and the band in massively informal party mood, with band members chatting and laughing away while the control room barks out ignored requests and Morrison inexplicably blurts out “Put your fur boots on!” before he launches into the song’s incongruously poetic lyrics (“Down on Cyprus Avenue / With the childlike visions leaping into view”). Oh, to be a fly on the wall during that debauched session. The gorgeous, jazzy shuffle of “Beside You” also makes an early, pre-Astral Weeks appearance here, serving as an early blueprint for one of rock’s most studied, unclassifiable albums. Morrison has always been a student of the blues, and deliberate, leisurely songs like “He Ain’t Give You None” and “T.B. Sheets” appear here, as well as an enthusiastic, harmonica-fueled version of the classic “Midnight Special.” The bluesy “Who Drove the Red Sports Car” also shows Morrison playing around with some of the more mystical, spoken, stream-of-consciousness lyric styles he would mine in later years. If he waited about ten or 15 more years to record this song, it probably would have included the requisite references to James Joyce and William Blake. A lot of the songs from these sessions manage to combine a gritty blues/garage band vibe with stellar hooks and a sophisticated pop song framework, not unlike much of the music Morrison would write and record throughout the bulk of his career. “Send Your Mind” is an energetic rocker that sounds like Bo Diddley after a triple espresso; “Chick-A-Boom” is an irresistible “La Bamba” rip-off (hey, if you’re going to steal, why not steal from Ritchie Valens? ); and “Joe Harper Saturday Morning” combines rich melody and spiky guitar leads with a thick soul/blues energy. The set’s third disc is dubbed “Contractual Obligation Session", and it consists of 31 short songs that were widely bootlegged and served as Morrison’s contractual obligation for Bang. As a result, they’re deliberate throwaways (with titles like “Ring Worm", “The Big Royalty Check” and “Blowin’ Your Nose”) and are provided here strictly for the sake of completists. I’m fairly certain only the die-hard fans will listen to the whole thing more than once. Still, it serves as a unique reminder of Morrison’s rarely displayed humor. For the casual Van Morrison fan who wants to hear what other gems came out of those heady “Brown Eyed Girl” sessions, this collection is a treasure. If you’re a die-hard fan, picking this up is probably already on your to-do list. It’s the sound of a visionary singer/songwriter, 50 years ago, finding his feet and looking to set the world on fire.